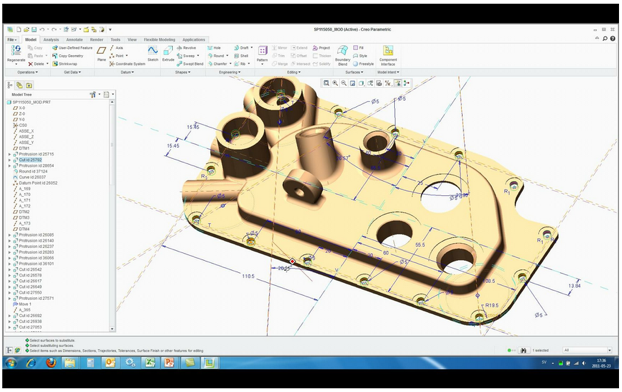 Creo 3D CAD Extensions provide users with tailored capabilities to enhance design potential. Capture anything, from structural frameworks to digital human models, using Creo CAD Extensions. Creo Flexible Modeling- Want more flexibility to overcome late-stage design changes? Creo FMX lets users choose and modify geometry and features within designs, to save time and decrease errors. Creo Advanced Assembly- Improves the productivity of distributed teams by managing design criteria, top-down assembly and process planning. Creo ECAD-MCAD Collaboration- Enhances your ability to collaborate between electrical and mechanical design teams and improve electromechanical detailed design work. Creo Advanced Framework- Lets machine designers and equipment manufacturers simplify and speed-up structure design work. Creo Manikin- A fully-fledged digital human modelling option, made to tailor your products for human-product interactions. Creo Piping and Cabling- Extract logic from schematics to automate your 3D pipe and cable routing.